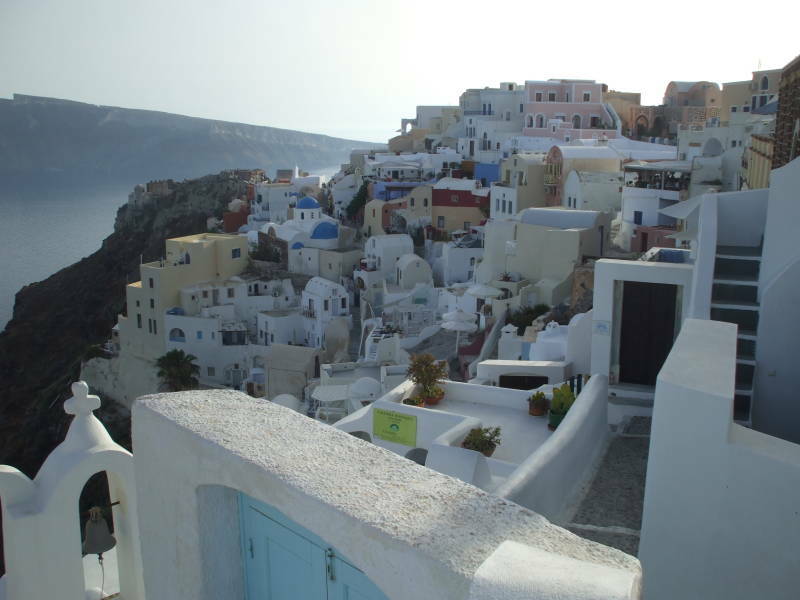 Santorini, also known as Thira or Thera, is a beautiful Greek island. 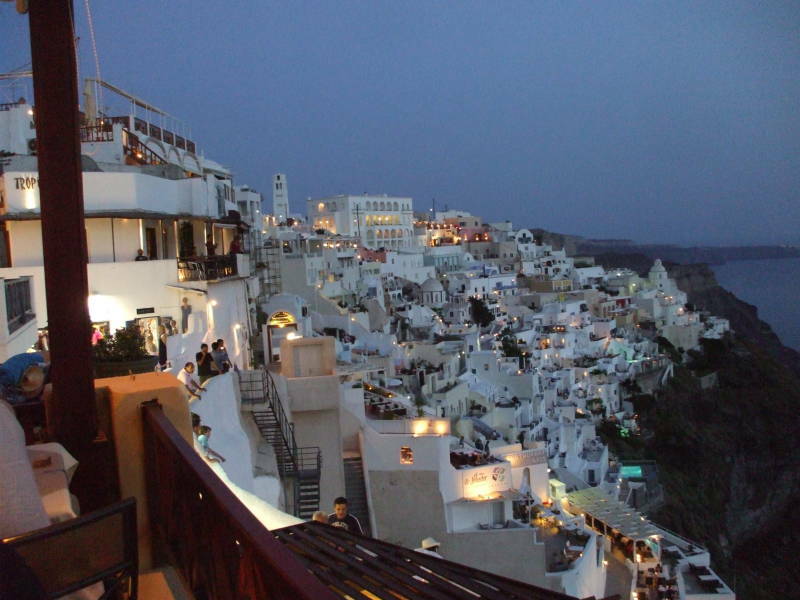 Santorini is the southernmost of the major Cyclades islands in the Aegean Sea, the closest one to Crete. This is one of the most-visited Greek islands, for good reason. Unfortunately for many people, it is just a brief stop on an all-inclusive cruise. You should visit the island on your own, it's easy to do. Thera or really Θηρα is the Greek name. 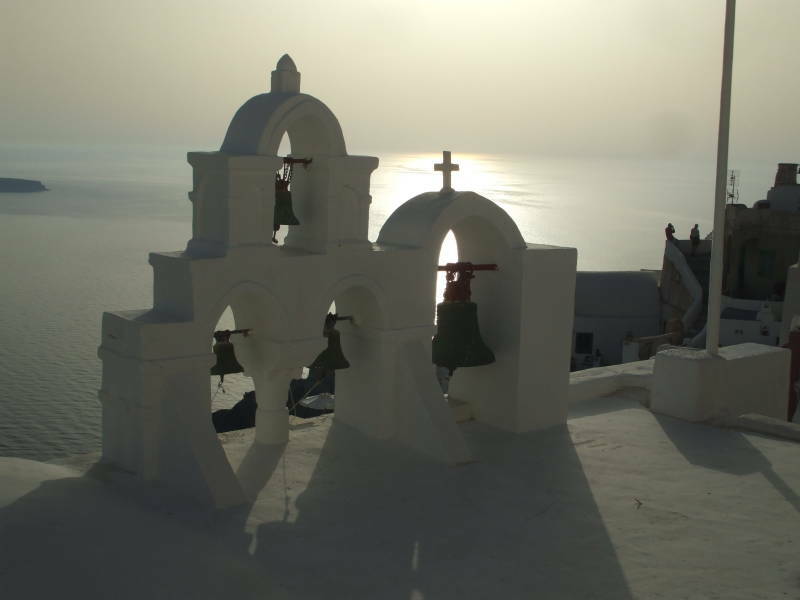 The name Santorini dates from its Italian language name, "Saint Irene", as the island was seized by the Venetians in the 1200s AD after the Fourth Crusade sacked Constantinople and overthrew the declining Byzantine Empire. Santorini is the backwards "C" shaped island between the red markers. 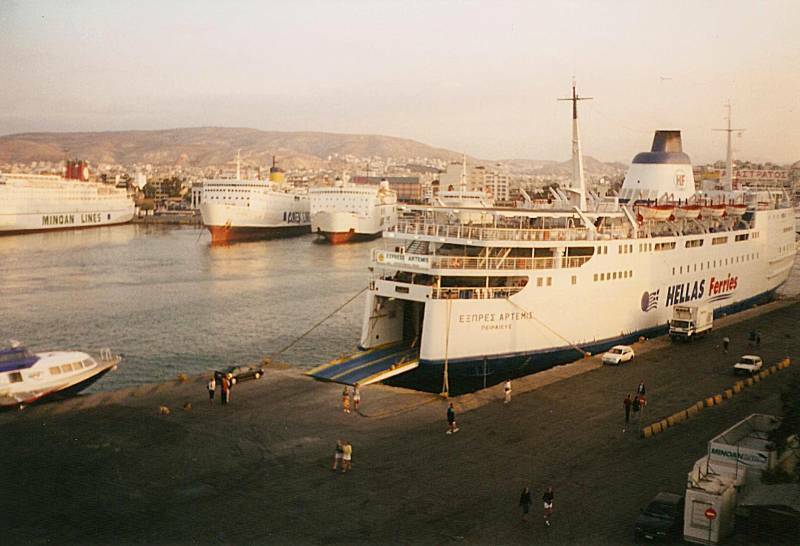 The Εξπρες Αρτεμις (Express Artemis) and several other ferries prepare to leave Piraeus, the port of Athens, around 0800. Earthquakes and pirates ravaged the island through the 1400s. The population in 1470 was just 300. In 1479 a group of forty destitute families sought refuge on Crete. A German pilgrim of 1521 describes is as so ravaged by the Turks as to be completely deserted. However, it is described as recovered in 1579, when it came under Ottoman rule. All these population figures are from "Depopulation in the Aegean Islands and the Turkish Conquest", F.W. Hasluck, The Annual of the British School at Athens, vol 17 (1910/1911), pp 151-181, citing earlier writings. The Greek War of Independence (or Greek Revolution) freed Santorini from Ottoman control in 1821. In 1830 the Treaty of London gave it to Greece. The Greek War of Independence was a curious thing, what with all the foreign involvement on both national and personal levels. Many wealthy Western European and American aristocrats took up arms on the side of the Greek revolutionaries, or at least financed the revolution. Probably most famously, Lord Byron, referred to as "mad, bad, and dangerous to know." Back in the 1800s when Mark Twain described a visit to Athens in The Innocents Abroad, Piraeus was a port city well outside Athens. Now it's the last stop on the Athens Metro line. You do have to pay more to ride that far, but it's now just another stop on the subway. You don't have to hire a donkey as Twain did. Start planning your trip! You can research schedules and even buy tickets online with this search engine. You do need to arrive at Piraeus in plenty of time. For one thing, the port is enormous and you have to find your ferry among the dozens preparing to leave. Also, there will be some tedious paperwork or at least ticket checking involved. Departures from Piraeus can be treated almost as if they were some sort of international trip. Ferry travel gets much more informal once you're away from Piraeus. Buy a ticket at the office in the island's port, then just show up on time and stroll on board. You enter the caldera of Santorini about eight hours after leaving Piraeus, having briefly stopped at a few islands along the way. 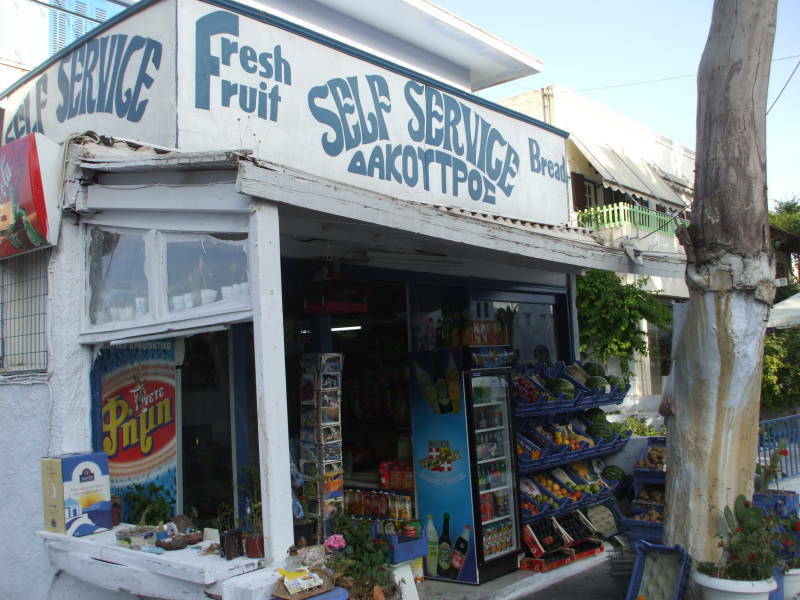 You probably stopped in Paros and Ios if you started in Piraeus. You might also have come via Mykonos. 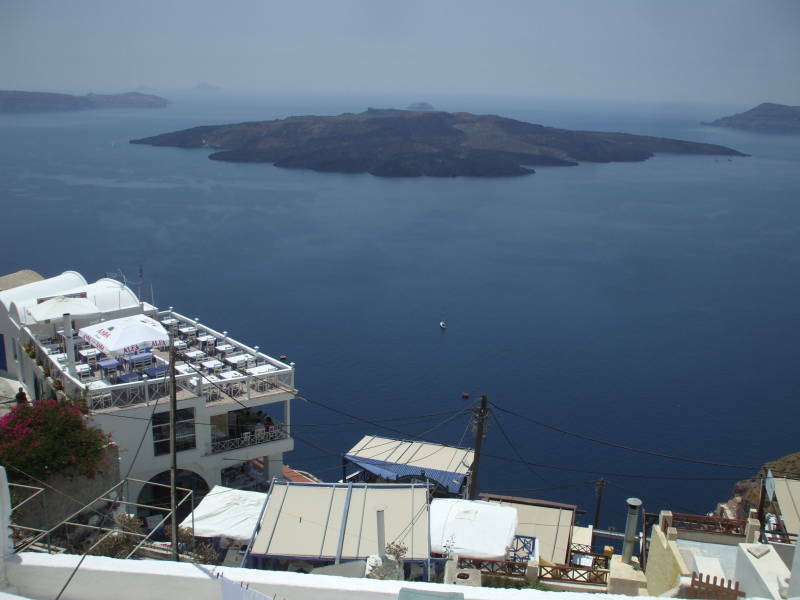 As your ferry enters the northern end of the caldera you pass Oia, a smaller town near the northern tip of Santorini. Beyond Oia in the distance, across the large open caldera, is the main town of Fira running along the high central cliffs. 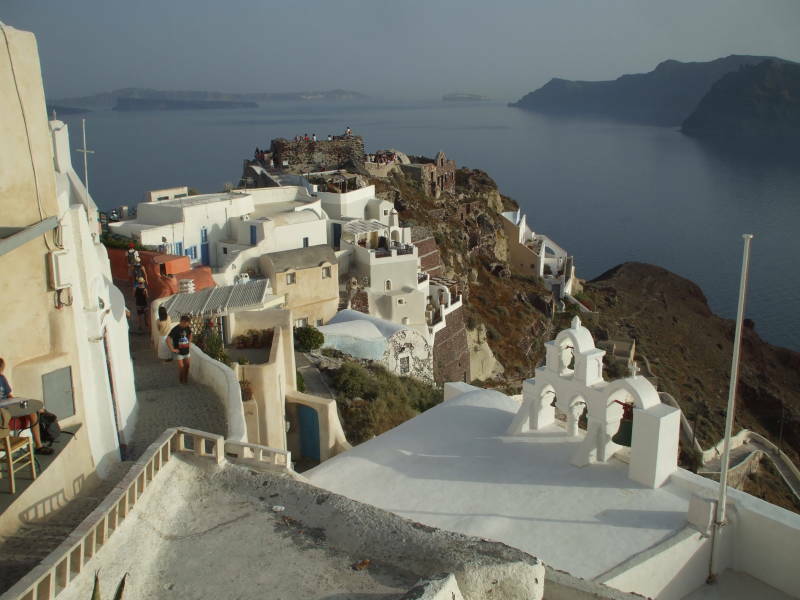 Santorini or Θήρα is the remains of a large volcanic island, the southernmost of the Cyclades island group. 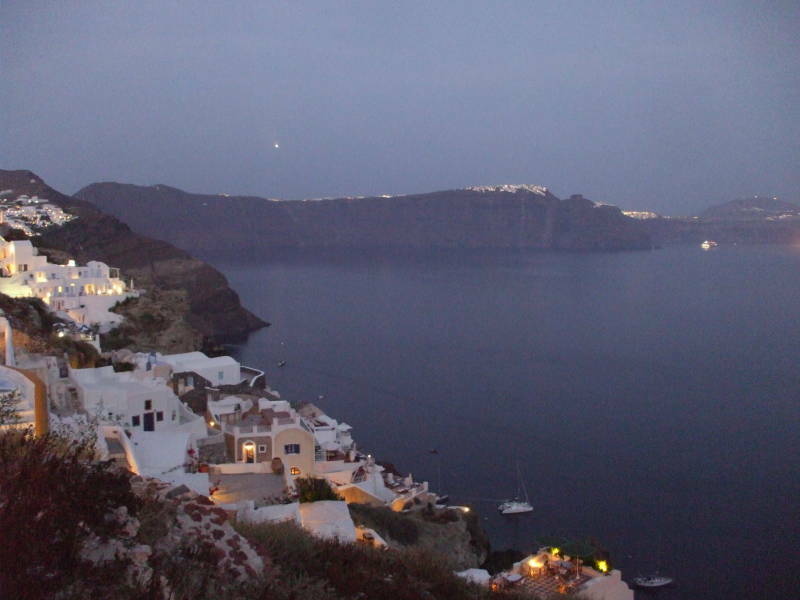 Oia, at left, is at the northern tip of the main island. 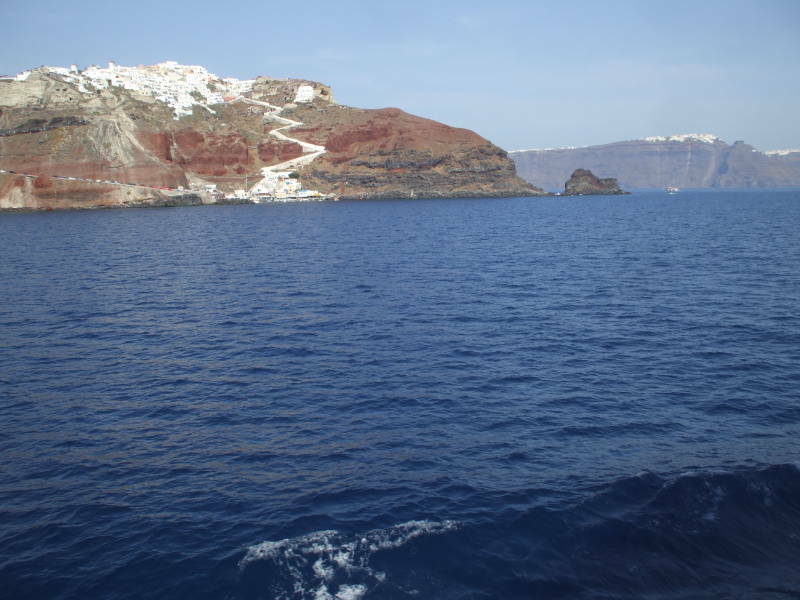 Fira, at right, runs along the edge of the cliffs overhanging the center of the caldera. 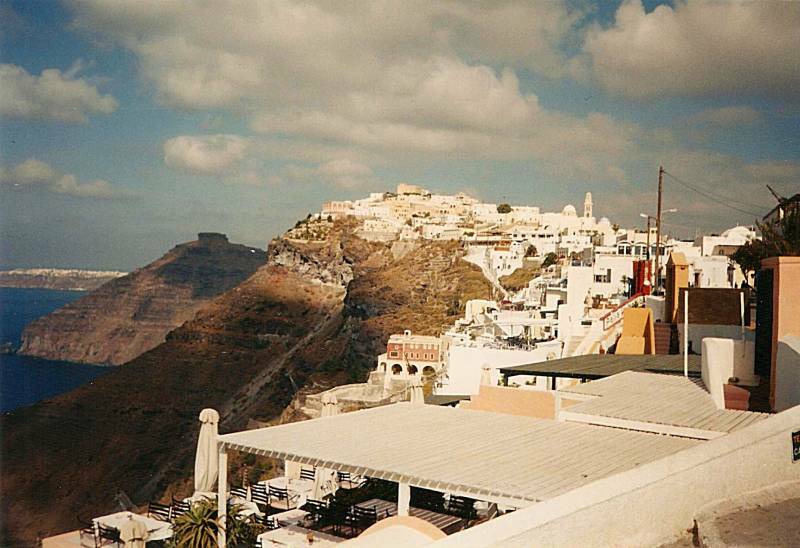 Fira, the main town, is on the edge of the cliffs overhanging the central caldera. The zig-zag donkey path is visible toward the left. Santorini Eruption Radiocarbon Dated to 1627-1600 B.C. Walter L. Friedrich et al, Science, V.312, N.5773 (Apr. 28, 2006), p. 548. The end of the Minoan civilisation Bill Downey and Don Tarling, New Scientist, 13 Sep 1984, pp 49-52. Volcanic shards from Santorini (Upper Minoan ash) in the Nile Delta, Egypt Daniel Jean Stanley & Harrison Sheng, Nature, v320,24, 24 Apr 1986, pp 733-735. The discovery of Santorini Minoan tephra in western Turkey Donald G. Sullivan, Nature, v333,9, 9 Jun 1988, pp 552-554. Tephra from the Minoan eruption of Santorini in sediments of the Black Sea F. Guichard, S. Carey, M.A. Arthur, H. Sigurdsson, M. Arnold, Nature, v363, 17 Jun 1993, pp 610-612. Santorini Volcanic Ash Found in Egypt S. Weisburd, Science News, V.128, N.19 (Nov. 9, 1985), p. 294. Pirgos is the port of the island. It's just a cluster of a few cafes and shipping company offices next to the pier, at the bottom of a steep and twisting road descending the caldera face through a series of switchback turns. Pirgos is to the west (left) of 1850 on this map. Small section of an aeronautical chart from the Perry Castañeda Library Map Collection at the University of Texas. 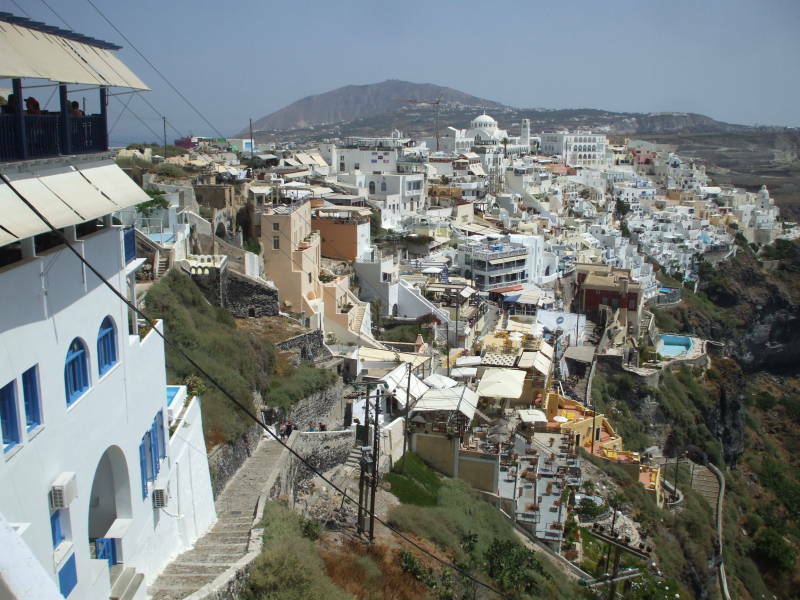 Fira, or Thira, or Thera, is the main town. It is twenty to thirty minutes' drive away, half of that spent on the series of switchbacks getting you up from the waterline to the top of the cliffs lining the caldera. It's shown on this map just south of Kondakhór. 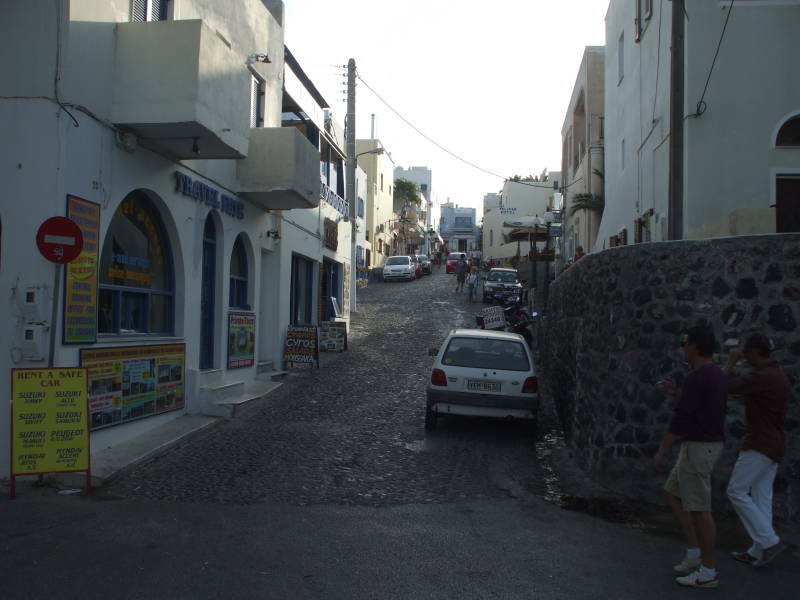 The town of Oia is at the end of the main road, at the northwestern tip of the main island. Below, we have arrived at the ferry dock and I'm looking back at the ship. 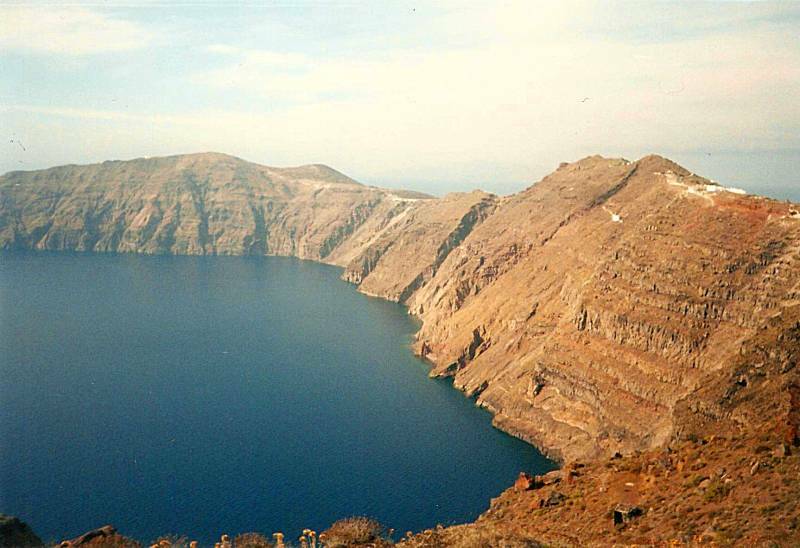 The port of Pirgos is down at the waterline in the central caldera, below the high steep slopes. 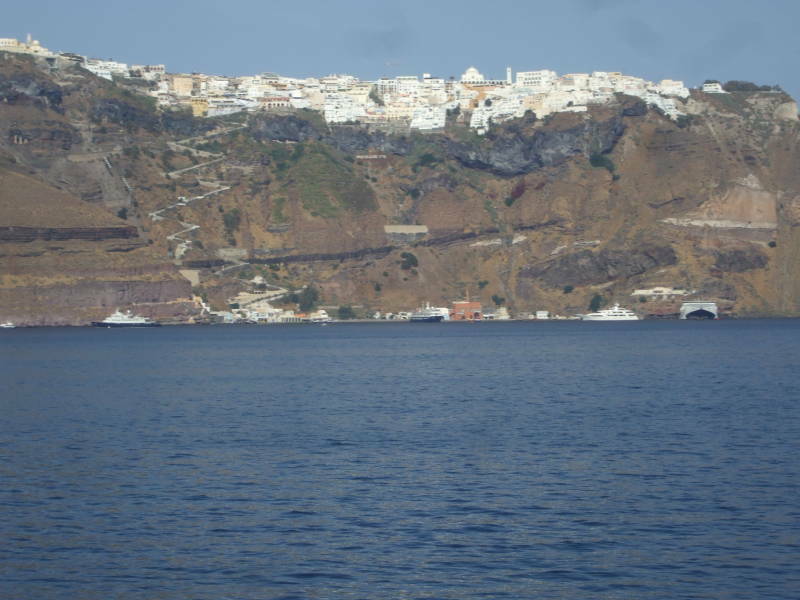 The main town of Fira isn't visible here, as it's on the top of the caldera cliffs behind the ferry in the picture above. 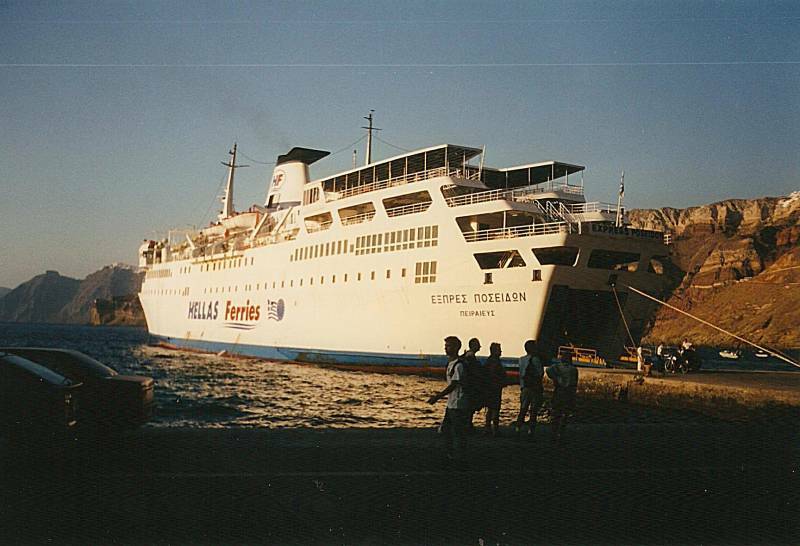 The Εξπρες Ποσειδον (Express Poseidon) arrives at Santorini's port of Pirgos. Below, we start to get some idea of just how far down it is from the caldera rim to the water line. 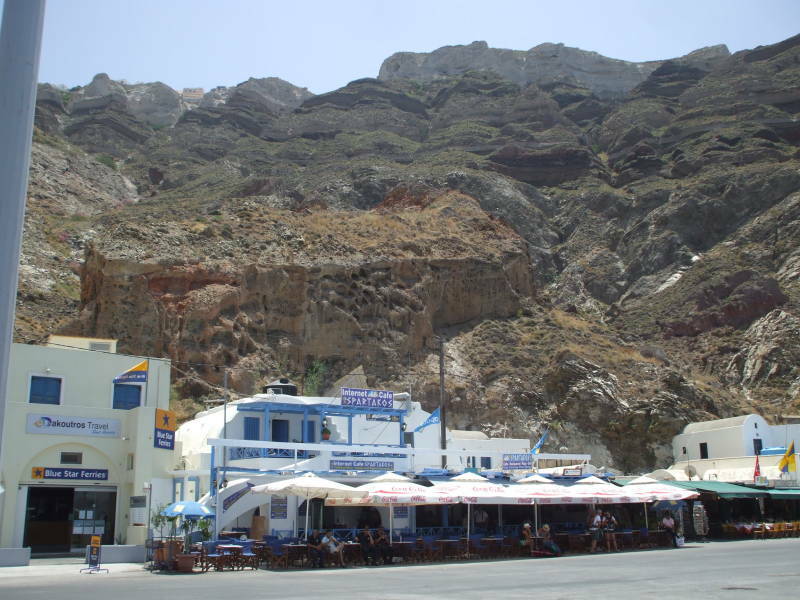 Santorini's port of Pirgos, below the steep caldera face. Owners of small domatia meet the ferry. 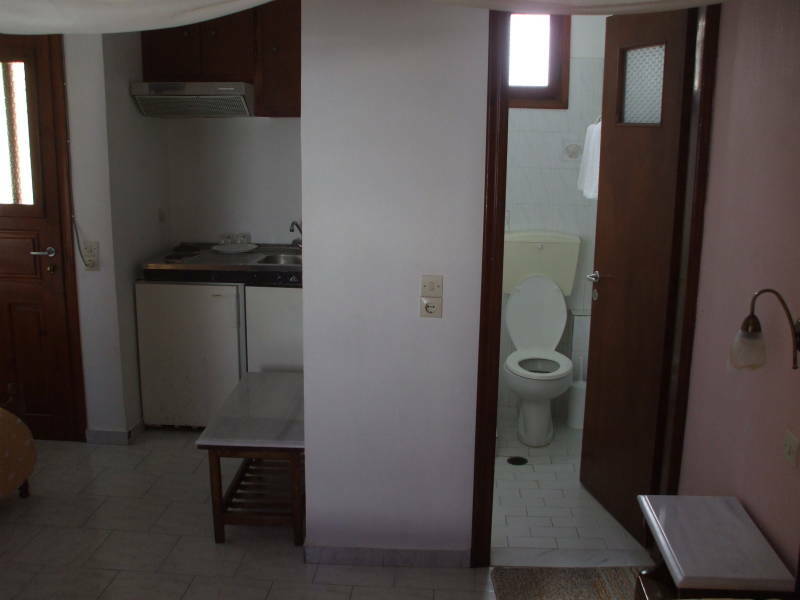 A δοματια or domatia is a small and simple lodging traditionally operated as a room rented by the homeowner. 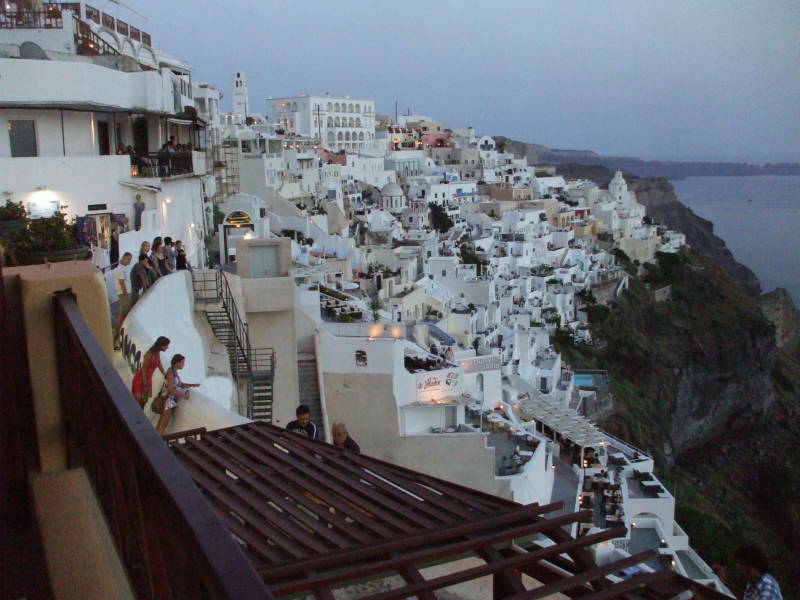 The domatias on Santorini and other commonly visited islands are more like small hotels. You should have no trouble finding lodging, and at a good rate, if you're there outside the high season as I recommended on the introductory page. The best time to visit is in late April through mid June, or from about the second week of September through the middle of October. 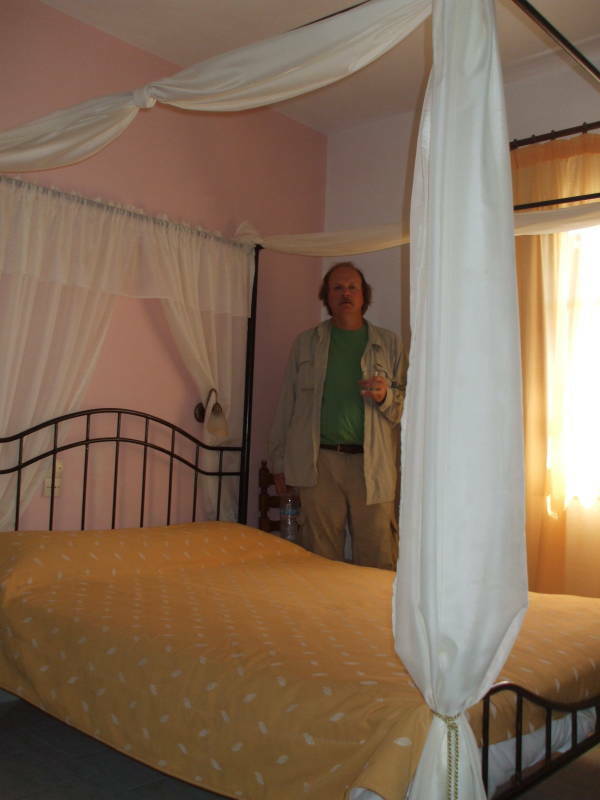 Yes, there is a hostel in Fira, but in May or September you can get a nice private room in a domatia for less than a bed at the hostel! Or at least that has been the case when I was there. Let's find our ride! Either in the van the domatia owner has driven down to meet the ferry, or the public bus that will take us to the main square in Fira. Fira is built right up to and slightly over the caldera rim. 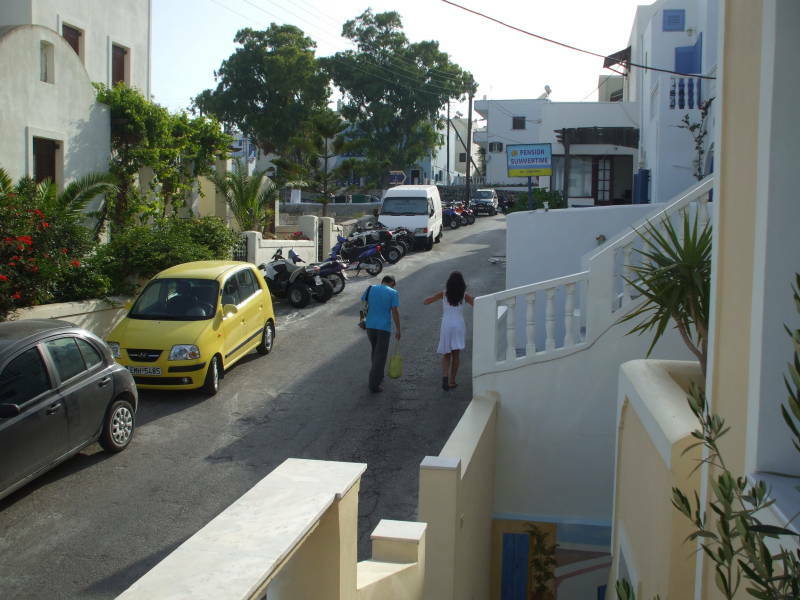 Narrow walkways join all the tavernas and domatias and shops. Those on the rim have fantastic views. The inner caldera face is high and steep. 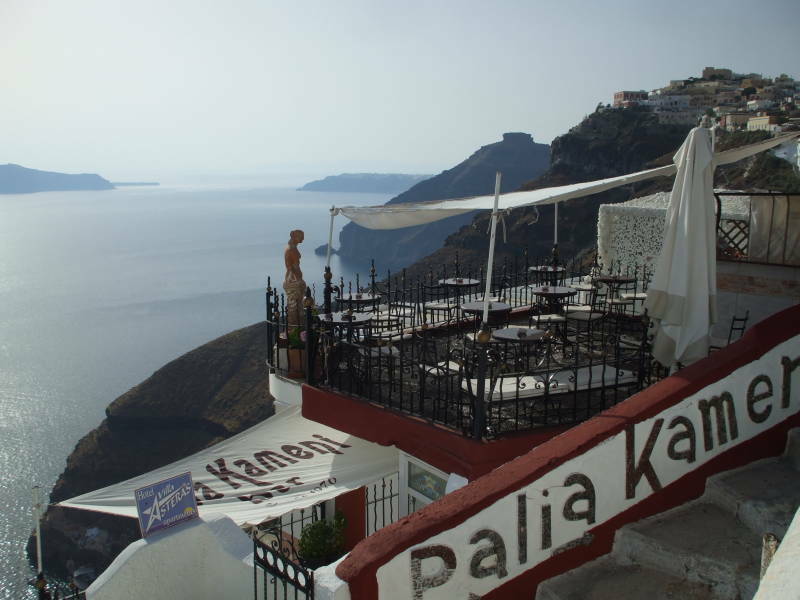 Fira is from 250 to 300 meters above sea level, and the caldera floor goes down to depths of 400 meters. 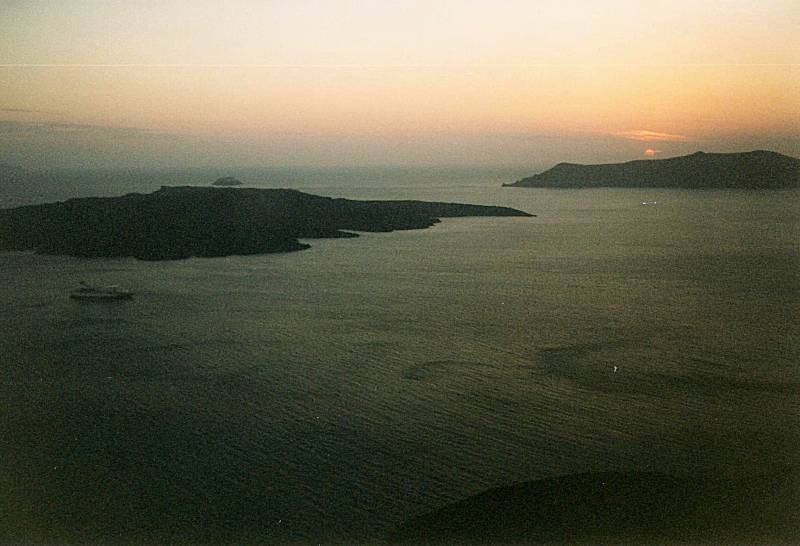 Νεα Καμενι or Nea Kameni is the small island in the center of the caldera. 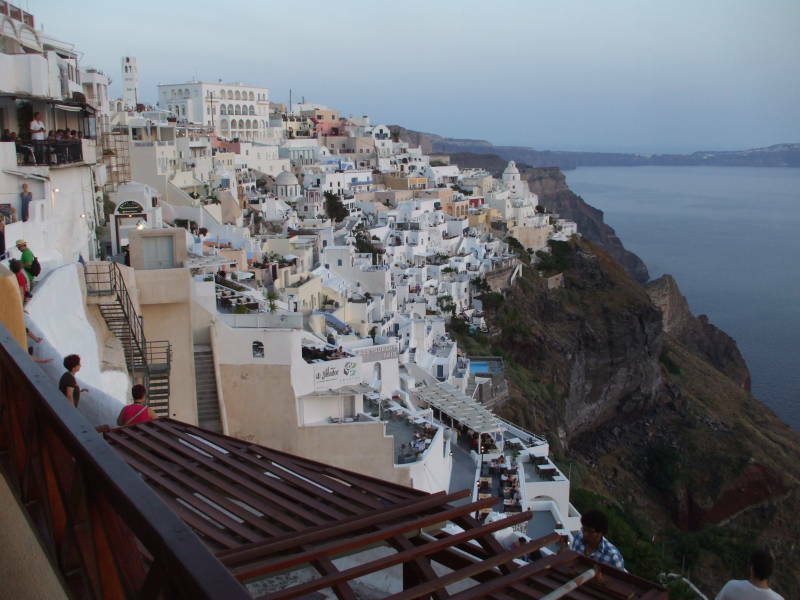 Recall the geological history of Santorini — it was a conical volcanic island. Then, about 3,600 years ago, much of the volume of the island was blown out in a massive explosion, leaving just fragments of an outer ring still projecting above the water line. Nea Kameni is the new volcanic cone building back up at its center. 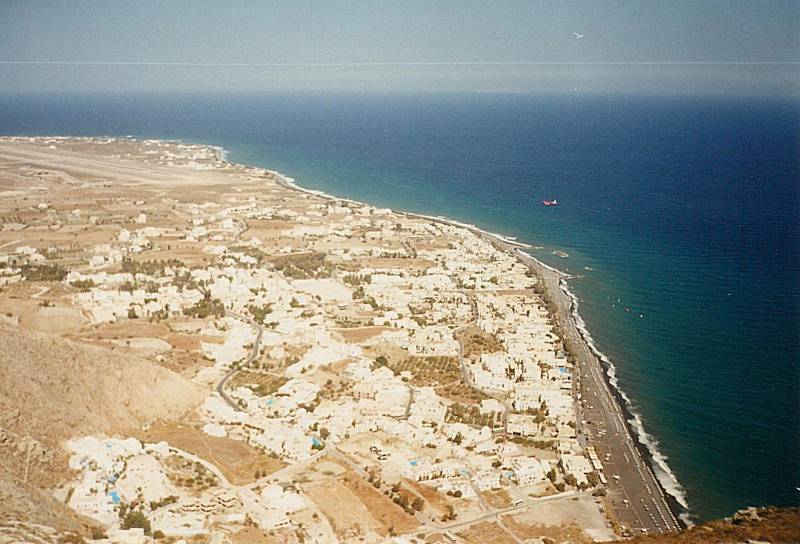 At far left in the pictures above and below you see Cape Akrotiri, the southwestern tip of the main island of Thera. The pictures above and below show Thirasia, a small island forming more of the ring outlining the original roughly round island. 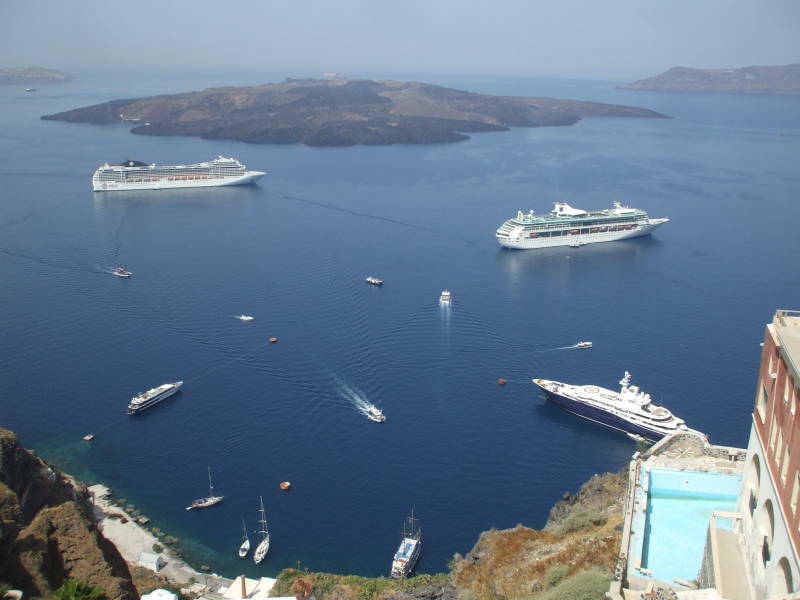 Some people visit the Greek islands on cruise ships, but that wastes a good opportunity. The cruise ships herd people onto an island for a whirlwind visit. "There is the cathedral, the souvenir shops are over there, make sure that you're back here in two hours so we can get you back onto the ship." The cattle are back on board and at the buffet, out of harbor and over the horizon before the sun sets. 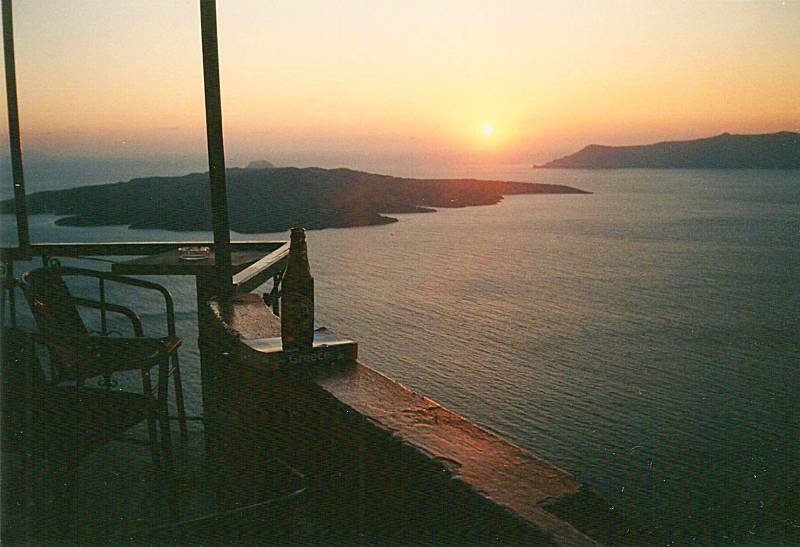 Meanwhile you're still sitting at the taverna watching the sun set. 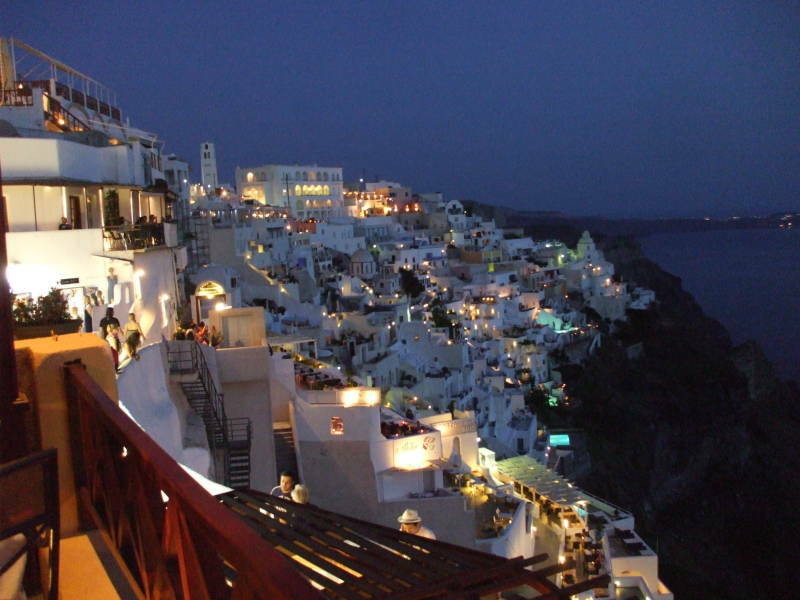 I have been to Santorini three times. 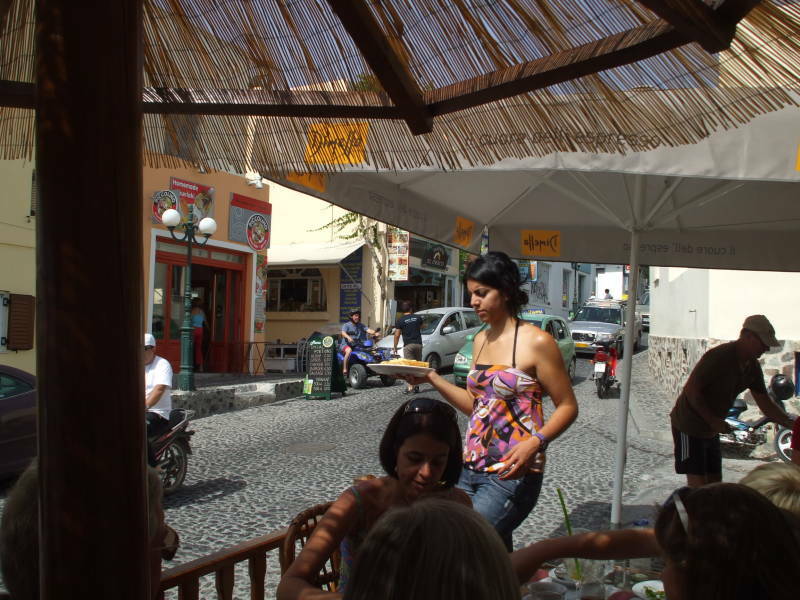 The first time I stayed at Hotel Antonia, close to the center of Fira. The second time, I stayed at Pension Petros, similarly close. That's Pension Petros below. In both cases I was there during the shoulder season, in mid-May in one case and late September in the other. I had no problem simply showing up on the late afternoon ferry and asking for a room. Don't count on that working during the busy time! As I was a return visitor who had brought others with me, and since the hotel was not yet full, I was given the very nice room at the very top, with its own kitchenette! 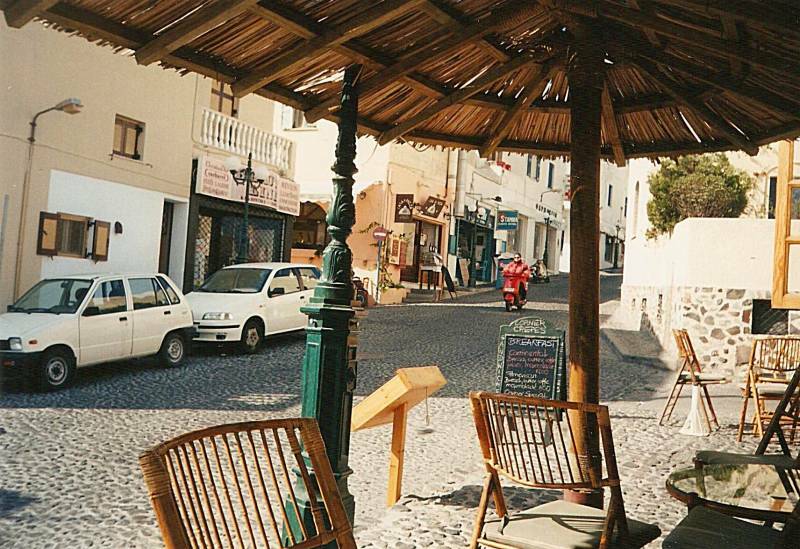 A short walk up the hill from Pension Petros brings you to the center of Fira. Let's do it! First, turn right and walk up to the corner. Second, turn left and walk over to the grocery store. 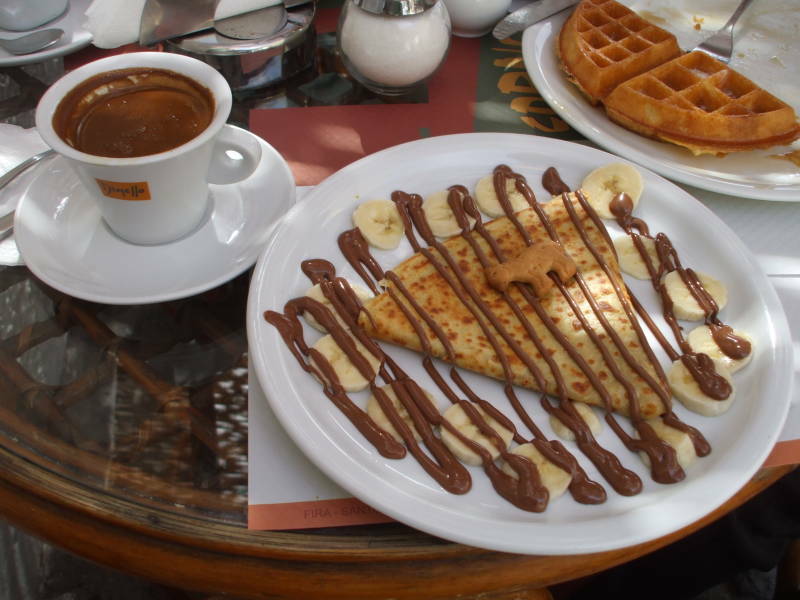 Third, turn right and walk two blocks up to the main square, passing Corner Crepes along the way. I got breakfast at Corner Crepes every morning. Businesses are open but not crowded during the shoulder season. Later in the day we will pick a place to get dinner and watch the sun set. There are plenty of nice cafes to choose from. 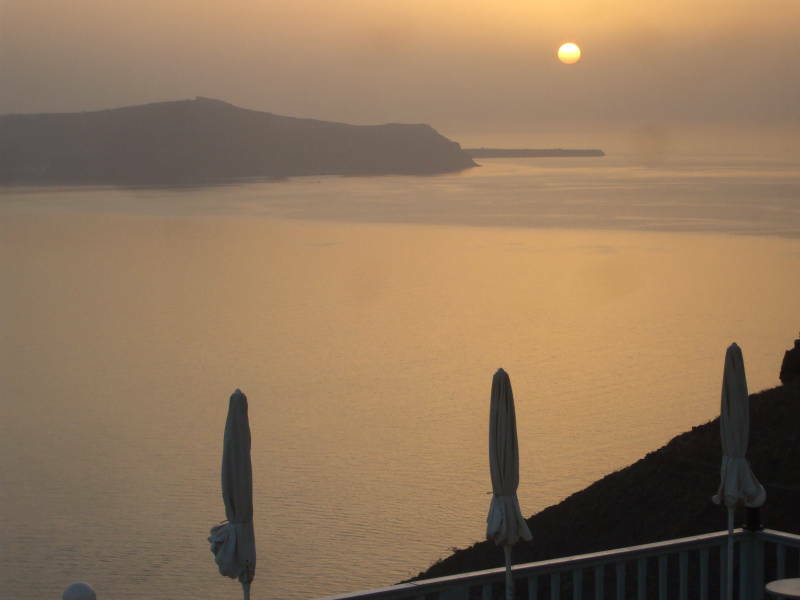 Here's what we will be watching: The sunset over the caldera. The sun is going down just north of the tip of Thirasia, a smaller island forming part of the fragmented original outer shoreline. 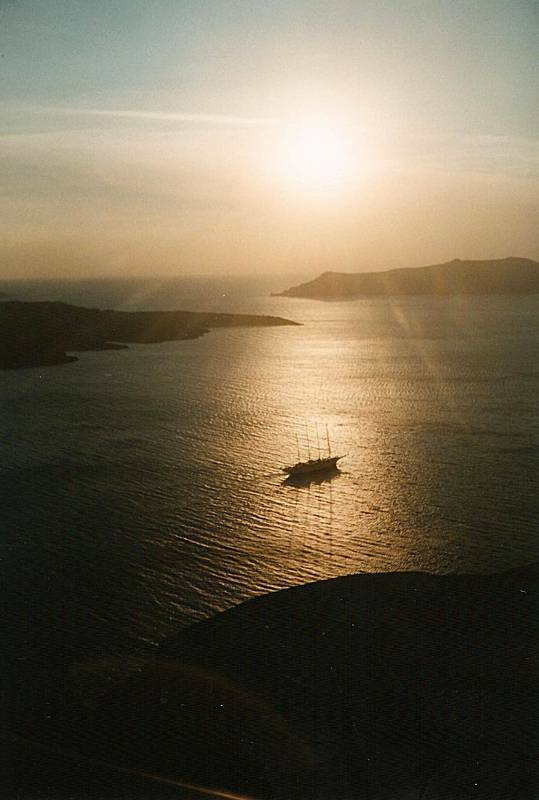 That opening to the right of the sun is the main entrance for ferries coming from the north, from the direction of Ios and Mykonos. The sun has dropped into the haze near the horizon. The sunlight is no longer direct. When we look toward our left, we are looking past the port of Pirgos to the southern arc of the main island. The ancient site of Akrotiri is just over that saddle in the distance. A few lights start to come on. Several people are watching the final colors of the sunset from the many walkways. More lights come on as it gets darker. A few lights become visible in the distant settlement near Akrotiri. There is no hurry to leave your table. The next day, we will pick a different place with a different view for a leisurely lunch. Beyond Fira in the middle distance you see the curving slopes of the caldera. The town of Oia is in the far distance at the northwest tip of the main island. Let's go to Oia. There is a path following the ridge line, with great views in over the caldera and out over the Aegean. 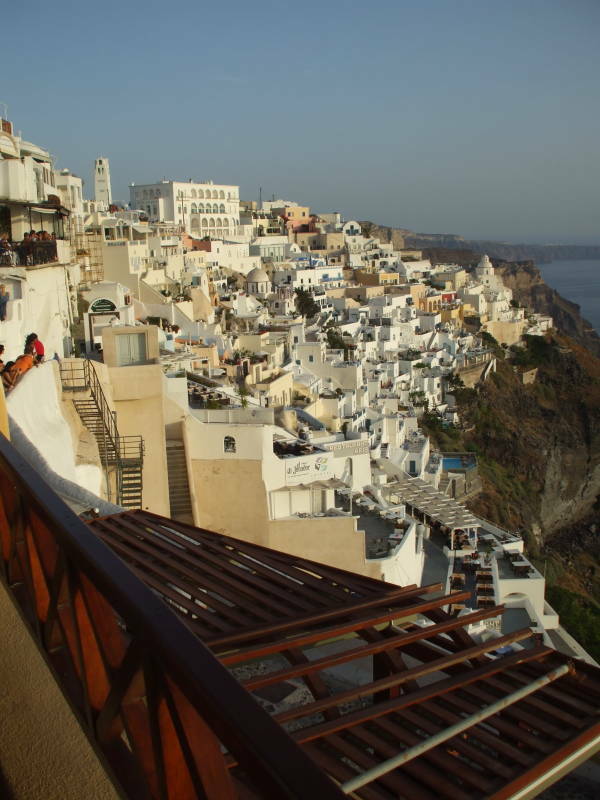 It's about 11 kilometers from Fira to Oia. Or, you can simply take the bus. As in the rest of Greece, ΚΤΕΛ (or KTEL), the national consortium of bus operators, runs the buses. 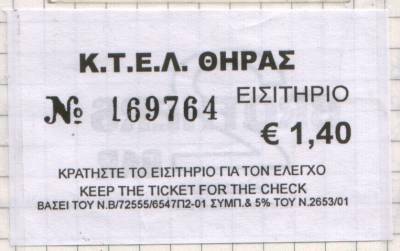 This is a ticket good for travel from Fira to Oia or vice-versa. Here we are in Oia. That's Thirasia in the distance at right, parts of Nea Kameni toward the left, and the southern tip of the main island curving around beyond them. Turning to the left, we look back across the northeastern caldera to Fira. 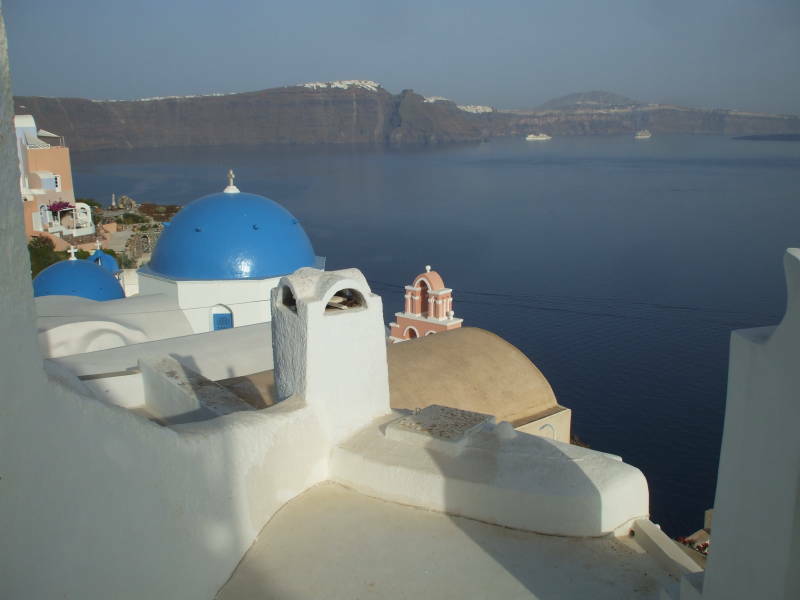 Oia was a prosperous home of a merchant fleet in the late 19th and early 20th centurys. 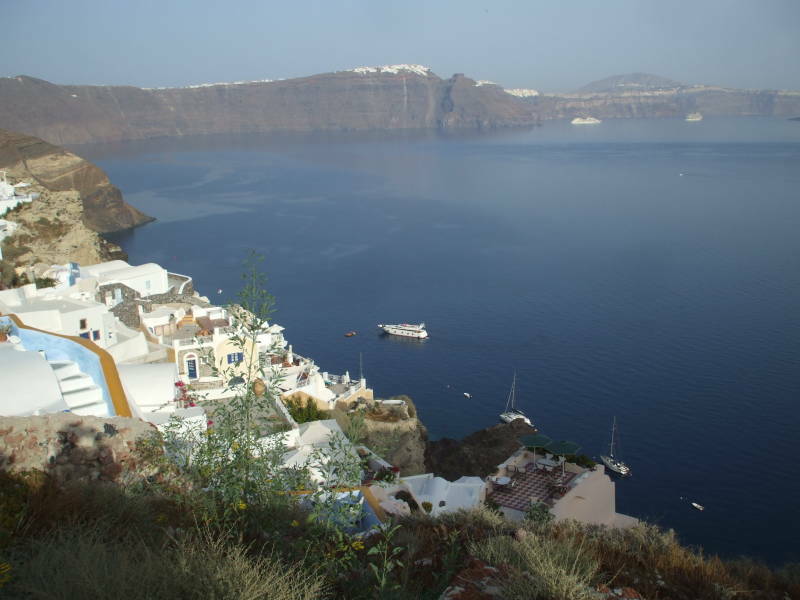 Ships from Oia carried trade throughout the eastern Mediterranean. They specialized on the route joining Alexandria, Egypt, with ports in southern Russia, by way of the Dardenelles and Bosphorus straits joining the Mediterranean to the Black Sea. 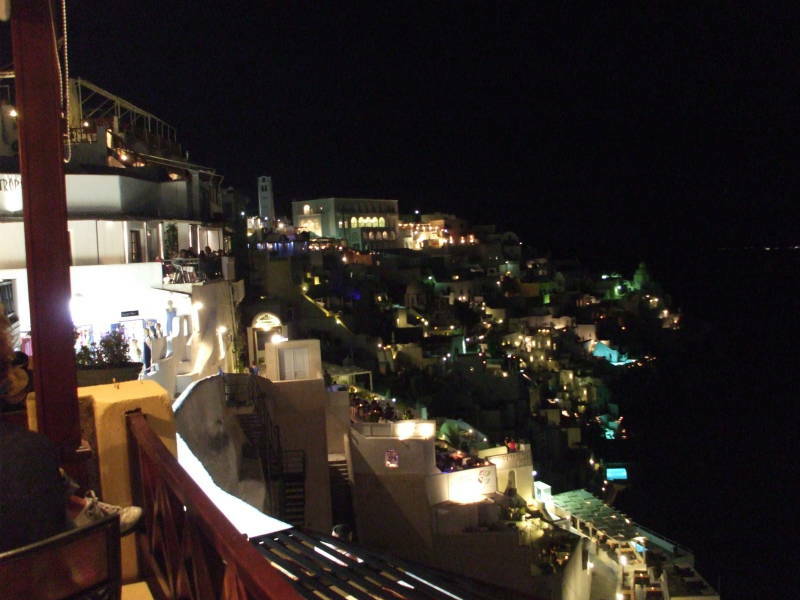 About 130 sailing ships were based in Oia in 1890, when about 2,500 people lived in the town. The development of steam shipping and the increasing dominance of the port of Piraeus started Oia's decline. Two world wars, the worldwide economic depression, and over-fishing made things worse. Then, in 1956 there was a 7.8-magnitude earthquake near Amorgos, with a 7.2-magnitude aftershock centered just off the coast of Santorini. By 1977 the population was down to just 306 people. 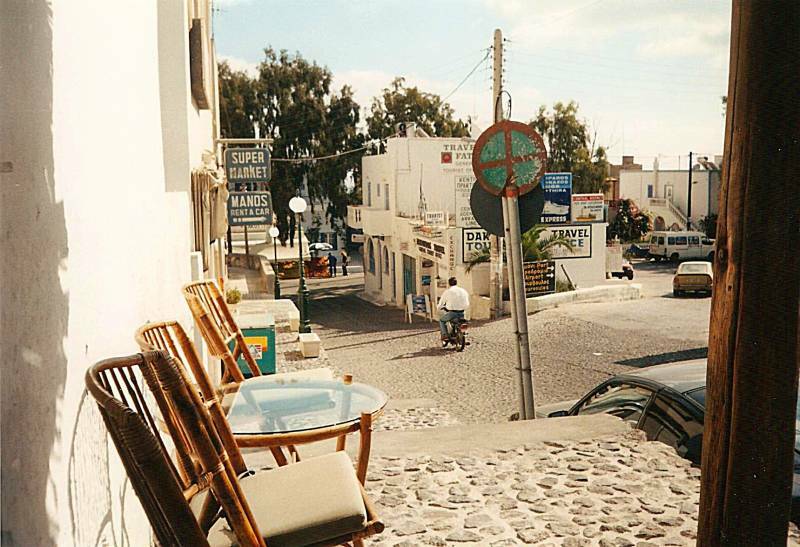 Like many Greek islands, Santorini has been pursued tourism since the mid 1970s. 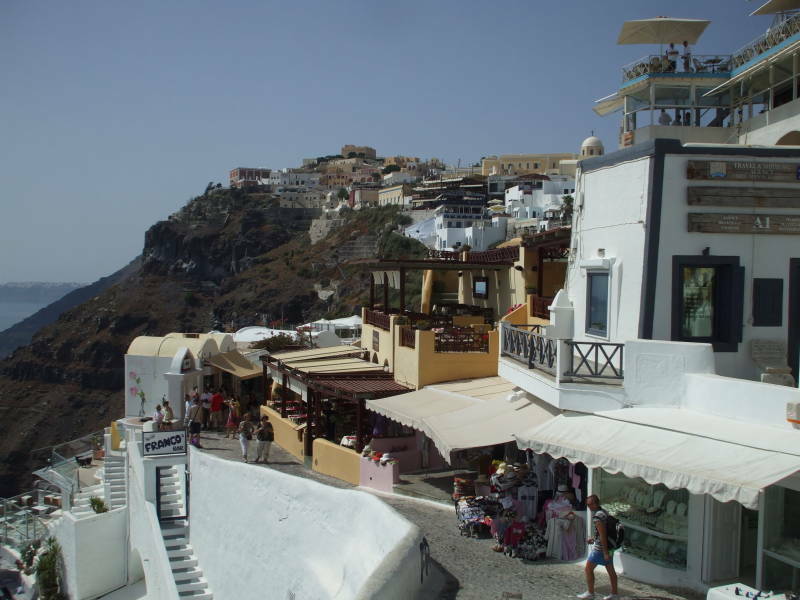 Buildings in Oia have been repaired or newly constructed. The current population is about 1,500. 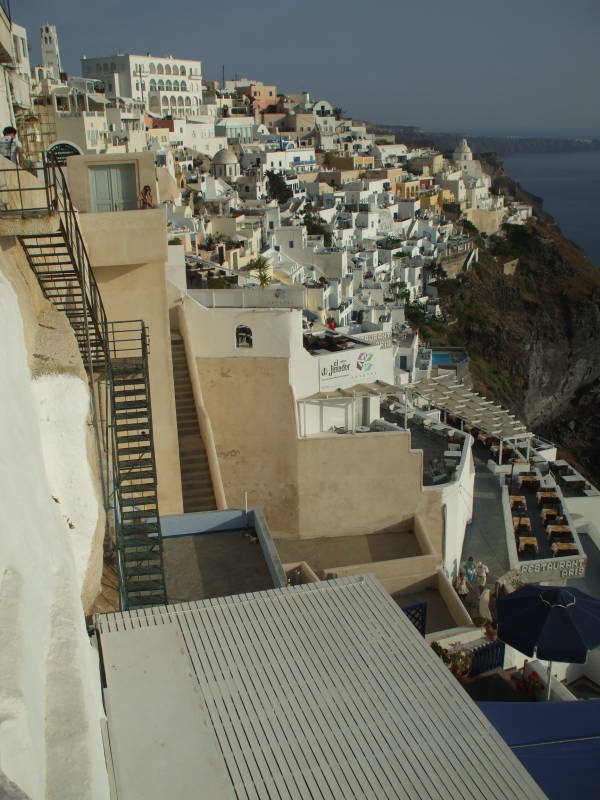 Just like Fira, Oia is based on a maze of narrow walkways. 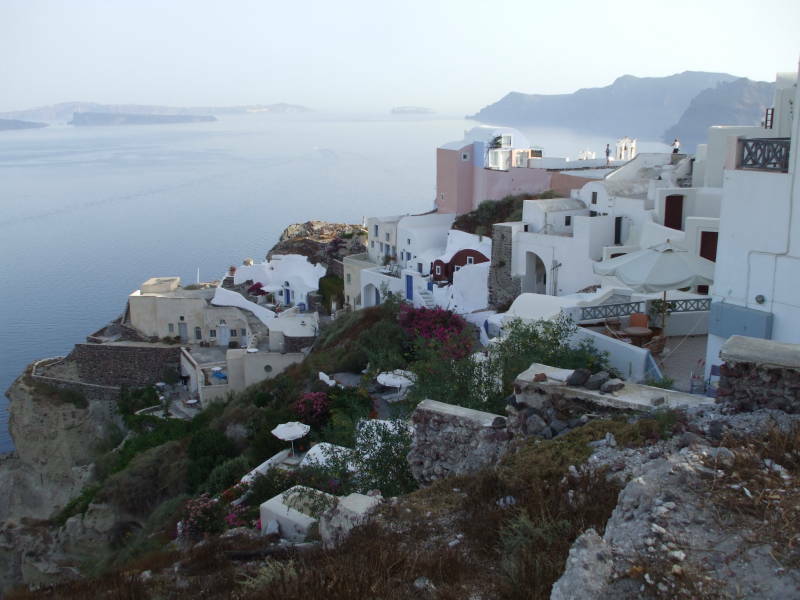 Oia is clustered at the very tip of the main island, overlooking the passage between it and Thirasia. The chapels all seem to have just received a fresh coat of whitewash and blue paint. 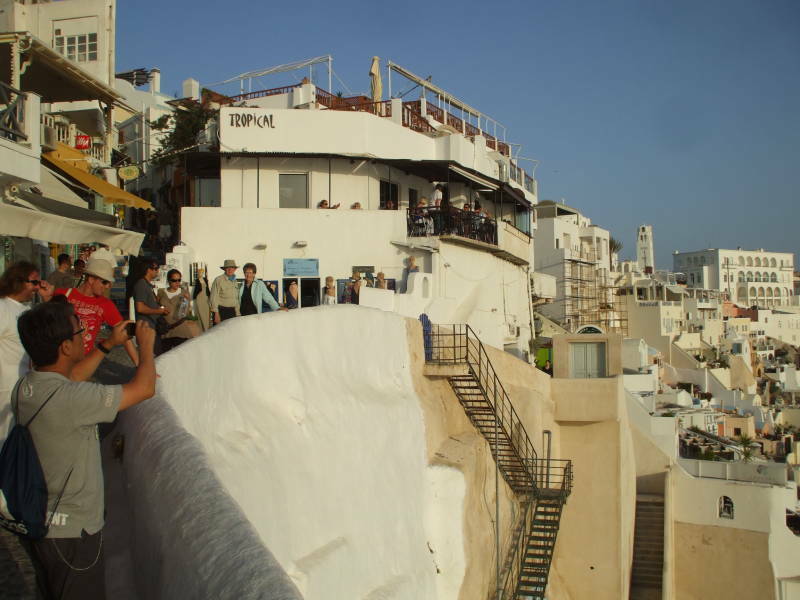 The big thing in Oia is to gather on the last outcropping and watch the sunset. The lights come on as evening falls. Fira is a string of lights on the distant horizon. An airliner climbs out of the Santorini airport, bound for Athens. In this view we are back in Fira, a little to the north of the center. You can see the round dome and tower of the cathedral in the distance. Beyond that you see the highest point on the island. This is the highest part that escaped being blown out in the great explosion. 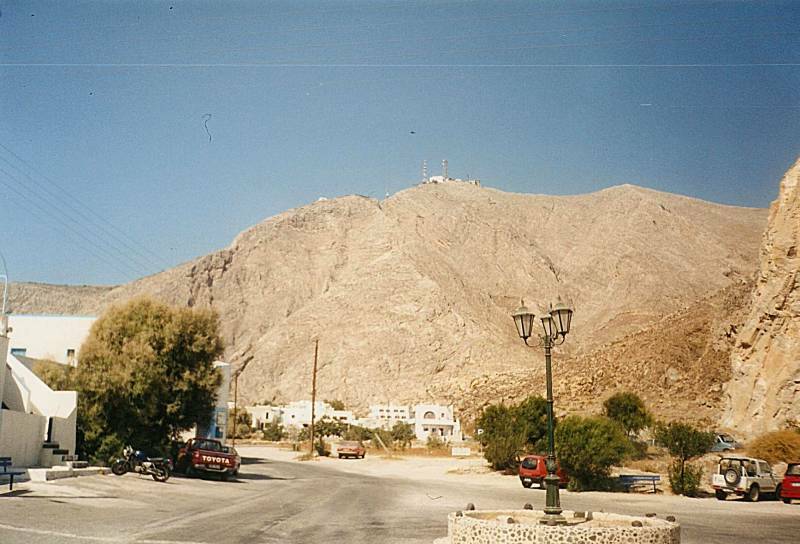 It is Moni Profiti Ilia, the Mountain of the Prophet Elijah. 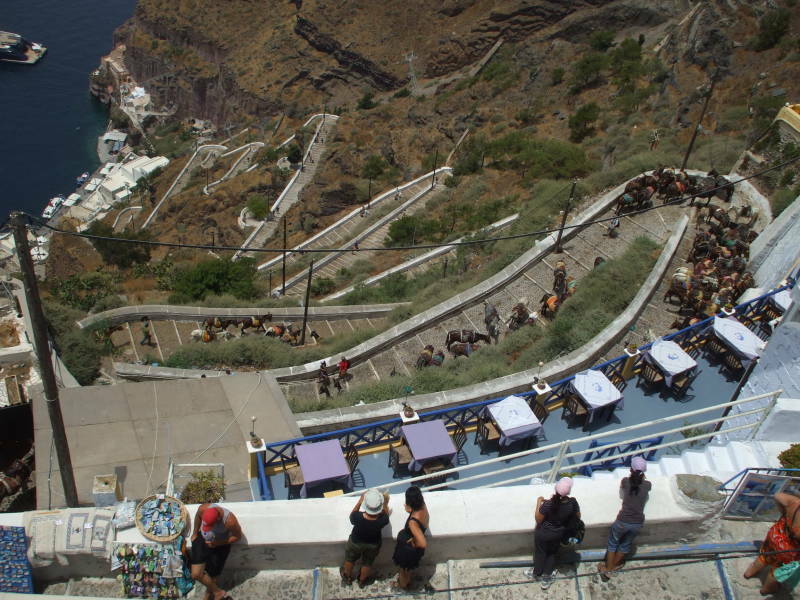 We're close to the top of the switchback path from the small pier below Fira. 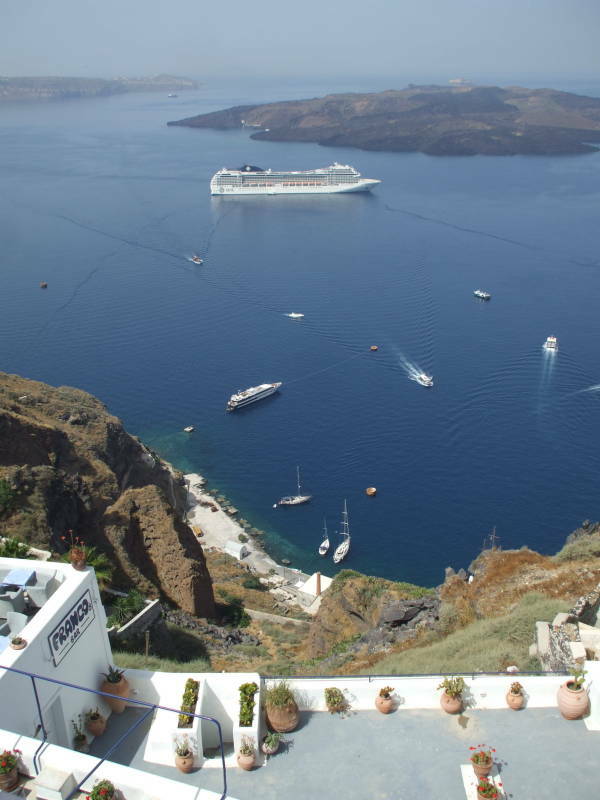 Groups from the cruise ships arrive in Fira by taking the cable car, riding the donkeys as seen at right, or walking up all the steps. No wonder there's a crowd on the stairs, look at all the cruise ships! Let's get away from the crowd with a hike over the island's highest point. 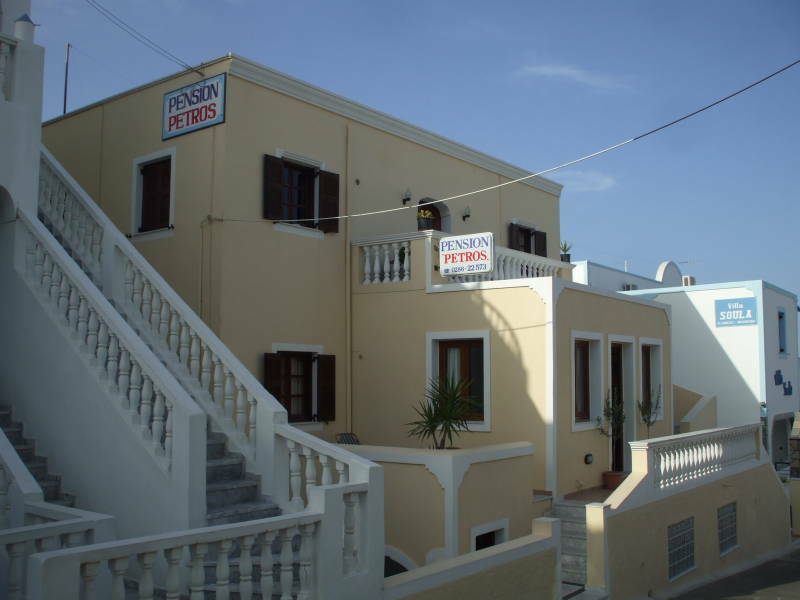 You can take a bus to Perissa, on the south-eastern outer shore of the island. Then hike up to Ancient Thera, about 300-350 meters up. From there continue on up Moni Profiti Ilia. The Monastery of the Prophet Elijah shares the peak with a military radar installation and lots of radio relay gear. Some VHF troposcatter antennas point south toward Crete and microwave dishes provide links to closer islands of the Cyclades. The peak is at 564m. In this first picture we are looking up at our goal. In one of the pictures below we are looking down over the east coast of the island, and down on an airliner approaching the airport. Santorini is one of the few islands with commercial air service. 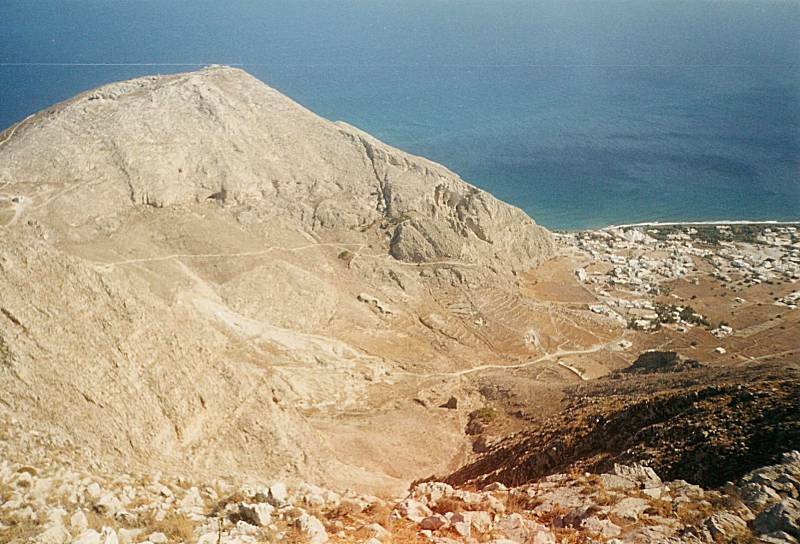 The peak is at 564 meters and you're starting from the beach at Perissa, so plan plenty of time for this hike. Now it's time to move on to another island! Maybe Ios, Mykonos, Paros, or any of the other islands.